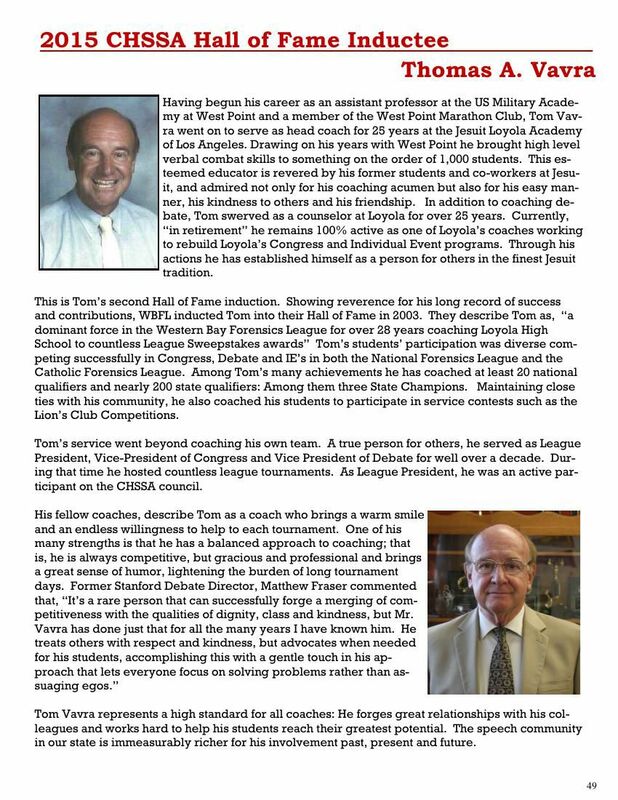 The members of the Hall of Fame certainly would agree that the honor of their induction is shared with the many students they have served through the years, just as the honors their students are shared with their loyal coaches. Just as assuredly, their students would attest to the generosity of those who have given of their time, treasure, and talents in preparing thousands of young people for productive citizenship and life-long success. Likewise, they would be humbled to share the honor with the countless other teachers and volunteers who joined them in the task. Candidates for the Hall of Fame are nominated by Leagues and voted on by CHSSA council members, leagues, and other Hall of Fame members not currently on the council. 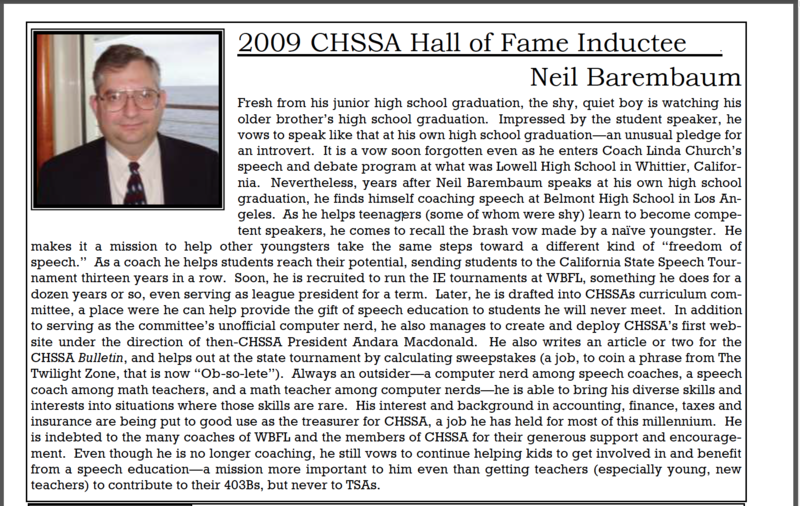 Below you will find information about our many CHSSA Hall of Fame honorees, as well as video interviews where they discuss their time as a coach/educator. CLICK HERE for all of the Hall of Fame interviews in one place. Can you think of a coach who is changing lives through speech and debate? Have they devoted 15 years to this activity? Here’s your chance to nominate them for the hall of fame. Using the form below, petition your local speech and debate league to nominate the coach who you think deserves this award. 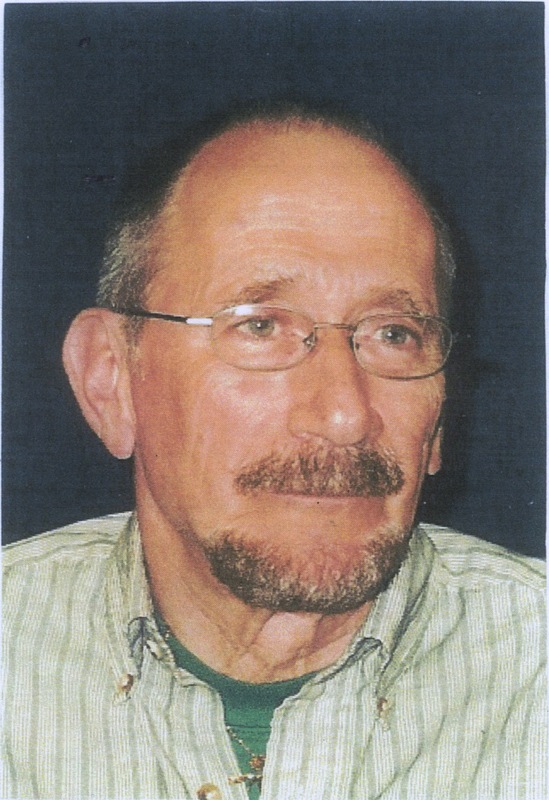 Each year one person is selected by the executive council to receive this award named after CHSSA’s first historian, Donovan Cummings. This award is given to someone who goes above and beyond to spread forensics throughout the state of California.